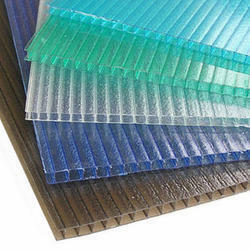 Offering you a complete choice of products which include polycarbonate sheets. We are a paramount organization that is engaged in manufacturing, supplying and trading Polycarbonate Sheets. Manufactured using high quality polycarbonate, these sheets are clear as glass and more resistant to breakage. All these sheets are perfect choice for glazing, skylights, store fronts, covered walkways, machine guards, displays and personal security applications.